Fireworks terrorize birds, but here’s how you can help. Fireworks terrify birds. But if you must, public displays are a better option. It may look pretty, but this is a disaster waiting to happen. Photo illustration by Slate. Images via 8213erika, RCKeller/iStock. Tuesday night, as the sky fills with the temporary stars of fireworks, take notice of what you don’t see: Likely, there won’t be a bird in sight. Birds, like many animals, are (rightly) scared of explosions. At the first sign of incendiary celebration, they’ll fly away. Unfortunately, their escape isn’t always successful: During a New Year’s Eve celebration in 2010 in Beebe, Arkansas, 5,000 birds dropped dead after a fireworks display disoriented the animals, causing them to crash into stationary objects like houses and cars. Eerily enough, another thousand birds died in Beebe a year later during the 2011 NYE celebrations. Beebe may be an extreme case (a great number were huddled in a winter roost, so the scared birds caused chaos), but it’s the not the only one. The city can’t ban fireworks because, despite the fact some residents spend thousands of dollars on their celebrations, they’re already illegal in Connecticut. So the city is recommending its citizens go to one of the many public fireworks displays instead. 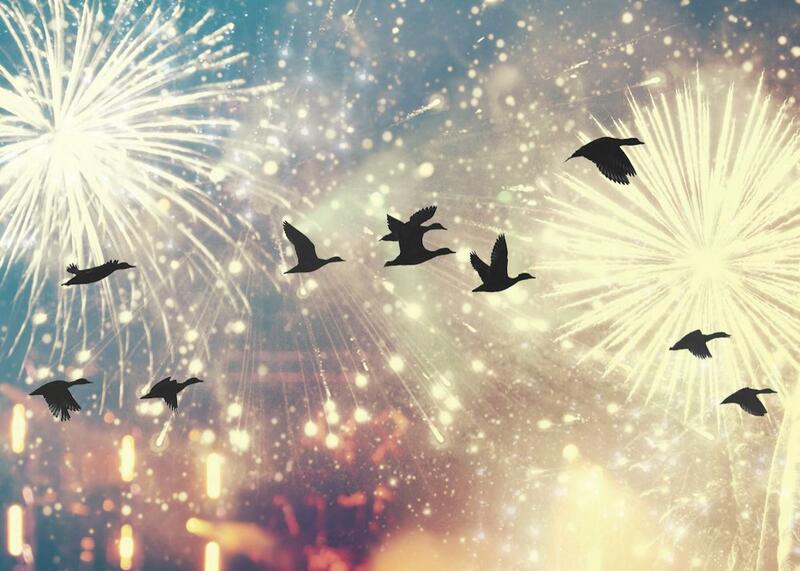 Why don’t public fireworks displays scare birds? Well, they do, but they’re much better, according to reporting from the National Audubon Society: First, it reduces the number of displays, which “allows birds to take off and land again in a ‘safer’ location rather than continuing to flee noises coming at them from all directions.” Likewise, “professional displays often take into account the natural environment and any impacts [displays] might have.” And there are plenty government-sanctioned displays to attend: Connecticut has 25 different public fireworks displays between July 1 and 4 this year, with eight of them landing on the Fourth itself. Columbia might have an especially patriotic reason to be worried about fireworks’ environmental impact, but it shouldn’t be alone in the concern. Americans loves fireworks. Last year, they shot off 285 million pounds of them, about 40 percent of the weight of the Empire State Building, scaring who knows how many birds. Of those, 260 million pounds were set off by individual consumers, while only 25 million were set off by official displays. By forgoing our pyromania to attend public fireworks displays, we could reduce the amount of fireworks to one-tenth. Of course, not everyone is willing to sacrifice fun for wildlife. In 2008, when Gualala, California, officials tried to ban fireworks to protect local seabirds, citizens filed suit against their local government and took the streets in protest. It took two years, but in 2010 the California Supreme Court ruled in favor of the city, banning fireworks displays without permits. Hopefully, most towns won’t need years of legal battles to come to a simple conclusion: Watching public fireworks displays is the environmentally friendly way to celebrate July Fourth.